We advertise real home cooking-and WE MEAN IT! The menu also boasts 134 sandwiches (including awesome Triple-Deckers) piled sky-high with fine Deli Meats as well as complete Dinner Entrees such as: Corned Beef and Cabbage, Roast Brisket of Beef, Stuffed Cabbage Rolls. An entire page is dedicated to our fantastic fountain menu which includes Sundaes, Shakes, Malts and Sodas with every delicious accompaniment imaginable. 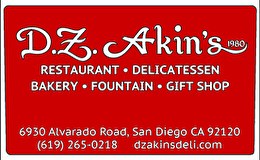 We also make the best cheesecake in San Diego-tasting is believing! For balance inquiries call the phone number to a D.Z. Akin's location below.